Calgary residents enjoy views of diverse architecture and unmatched natural beauty. The city is famous for its reputation as a cowboy town with rich, western heritage which you can discover at many Calgary attractions. But as a highly cosmopolitan city, there are attractions in this exciting city that showcase arts and music, aviation and technology, and many that offer plain old family fun for visitors and residents alike. From natural wonders to world-class attractions, this city will not disappoint. As you get acquainted and learn more about the city, you’ll find new and exciting attractions around every corner. 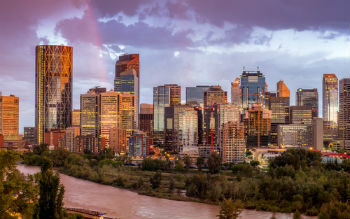 If you're looking for the latest Calgary relocation and real estate information, be sure to check out our Calgary Relocation Guide or read more about some of Calgary's top attractions below. Located in its original location on the south bank of the Bow River on the west side of the Elbow, this replica 1875 fort and adjacent barracks is a must-see. This is the birthplace of Calgary, founded by Colonel James Macleod. The log fort was built on the exact location as the original based on archaeological evidence. The interpretive centre provides visitors with a 19th century snap shot of early life in Calgary. Located across the Bow River from Fort Calgary, the zoo is located on St. George’s Island. Exhibits unique to the Calgary Zoo include the prehistorical park and animals native to Western Canada. There are many festivals throughout the year, such as Zoolights at Christmas. Open year round. Once the tallest structure in the city, the Calgary Tower is an iconic fixture. The 60-second elevator ride whisks visitors up to the observation level where one can marvel at the views of the endless prairie and the mountains to the west. The floor of the dining room below the observation deck rotates so patrons can enjoy the 360 views while enjoying an excellent gourmet dinner. It was the Greatest Show on Earth that helped put Calgary on the map. This annual 10-day bust-up includes a world famous rodeo, chuck wagon races, mid-way, livestock show and all the pancakes you can eat on every street corner of the city. The Stampede kicks off with a parade through downtown Calgary on the first Friday of July, as it has every year since 1912. Stampeding should be on everyone’s bucket list. Located downtown on 9 Avenue by the Calgary Tower, the Glenbow is Western Canada’s largest museum. It showcases traveling exhibitions and houses the largest art collection west of Winnipeg. Permanent exhibits on the Glenbow’s 3rd floor tell the story of settlement in Southern Alberta. Archives on the 6th floor include clippings, audio files and books, open to the public. See realistic depictions of the victories and sacrifices made by the Canadian Forces and Calgary regiments who fought for our country. Walk through a trench from World War 1, see the uniforms and artillery actually used in World War II or witness a bombing mission over enemy territory. Located on Crowchild Trail in the community of Garrison Woods, the museum is dedicated to the navy, army and air force squadrons of Canada. Located just north of the Calgary Zoo in Bridgeland, this next-gen science centre is guaranteed to ignite a sense of wonder in every member of the family. This is where science, technology, math and art intersect. There are hands-on exhibits, a creative playground and with ongoing events. Opened in 1977 in the heart of downtown Calgary, this 2.5 acre indoor park and botanical garden is on Stephen Avenue between 2 St SW and 3 St SW. Recently renovated, it is completely enclosed in glass and includes a living wall, fountains, koi ponds and more than 500 trees. There is also a play area for kids. Admission to the gardens is free. Created on the Paskapoo Slopes just south of the Trans-Canada Highway, Winsport Canada Olympic Park is a legacy from the 1988 Winter Olympic games. Ski jump, luge and bobsleigh events took place here. Athletes from around the world still train at this facility, which has been expanded to include four Olympic ice rinks. Public downhill skiing is available December to March, aided by snow making machines. Visit the tea room at the top of the ski jump tower or try the zip line. This is how the west was fun. This fantastic park is 127 acres of historic buildings, preserved and decorated with genuine artifacts. There’s a working antique midway, a real steam train, horse-drawn wagons and a farm complete with animals. Staff in period costumes roam the main street or serve you at the candy shop or bakery. Gasoline Alley and the 1930s Main Street are open year round, with the village open May to September. Located on the east side of the Glenmore Reservoir off Heritage Drive. Located just a few hours out of the city, the Banff National Park is the first of its kind in Canada. It offers unparalleled mountain views, stunning waterways, adventure and beauty. This destination is top of the list for many avid travelers and as a resident of Calgary you’ll have the opportunity to visit it every weekend. Moving to Calgary? The Justin Havre team are relocation experts, get in touch today with your questions and to arrange showings.